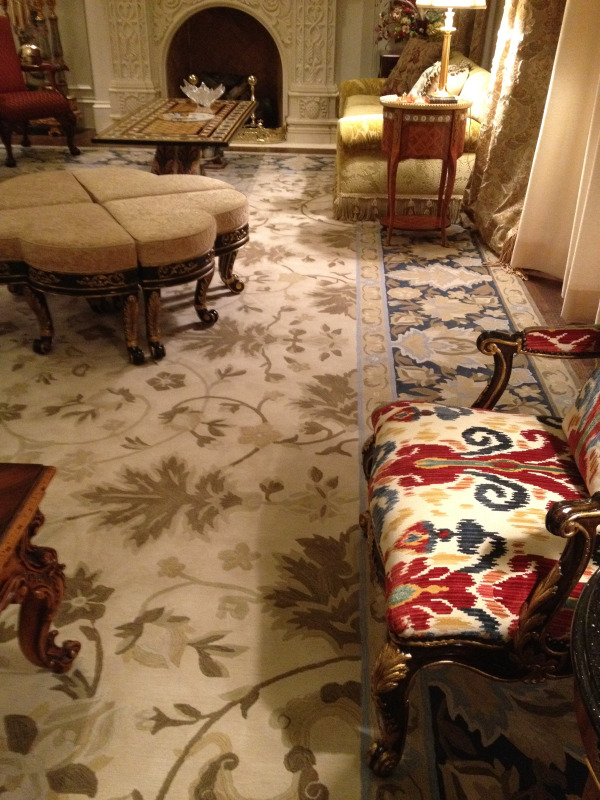 Rugs can be as basic as a tufted simple one color regtangle to a woven or needlepoint multiple color design. You can purchase them pre-made or customize. The word custom can mean lots of things. Are we taking a broadloom (a wide peice of roll carpet) and making it a smaller size or shape? Or maybe you would like to have a special color border added. There are custom rugs for all budgets. In this article you will see a very high-end version but rest assured if your budget isn't quite there we can work with you to get a great look to suit most any budget. 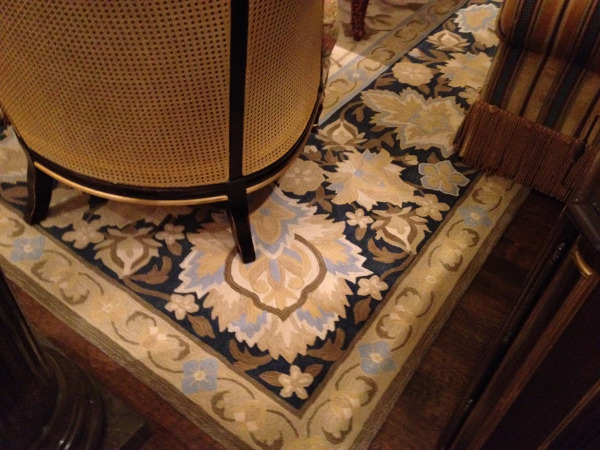 Many times at Floor Partners we create rugs from carpet that comes right off a broadloom roll. Other times we design a rug that is customized down to the construction, fiber (the yarn), the colors, design pattern and of course size. 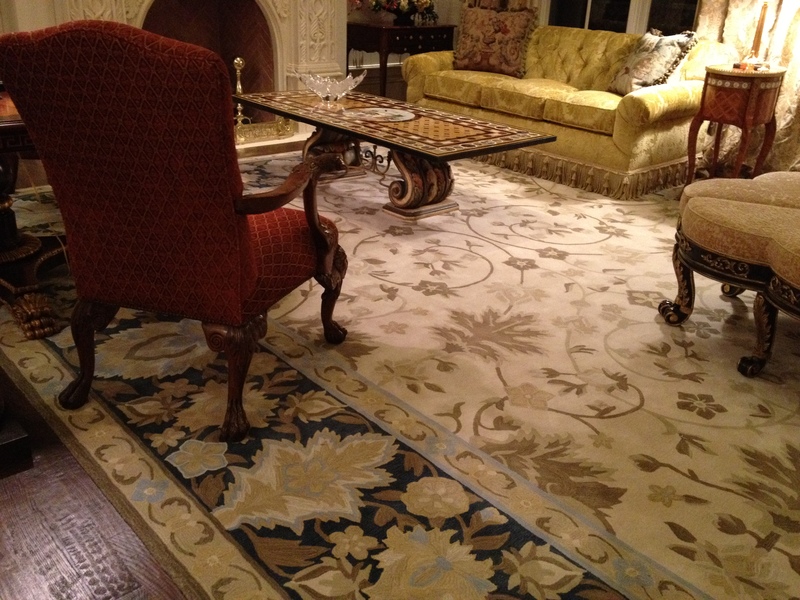 The rug included in the photos are from a home in Southlake, TX for a Grand Parlor. The final rug was 15' x 27'. There is lots of entertaining done here. The rug needs to be luxurious & beautiful as well as functional to stand up to traffic, refreshments and even little grandchildren! Our Interior Designer, Kristen Mangus, worked alongside our client's designer Donald Coan. We carefully selected a pattern from Fabrica to work with and move, deleted, and morphed features to make it uniquely for the client. The color palette for the home and furnishings had been speficied so drawing from there we pulled out color palette for the rugs. Kristen hand rendered a drawing to illustrate where the colors would fall. After a few revisions the official color paper strike-off was made, approved and then a custom carpet sample was made. Once the order was placed it took 6-8 weeks. You can see that this rug is a gorgeous addition to the home. Their eclectic style of classic & new furnishings paired with a rug that sets the stage with just as much intricacy, without overtaking the furnishings, is an important key to the room coming together. 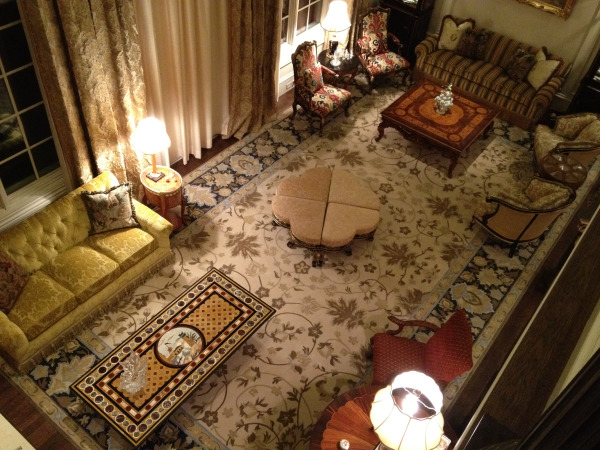 Custom carpet & rugs can make a difference in making a house feel like a home. With a plain carpet or standard on their handscraped hardwoods, the large room would feel empty or disconnected. This rug draws the large room together to make it feel cozy although it could seem like two living rooms with a very tall ceiling. We are happy to have been part of this design for the family and look forward to designing more custom carpet & rug solutions for our clients. Call us today to see how we can help you on your next project! Article written by Kristen Mangus of Floor Partners. Kristen is a registred Interior Designer in the state of Texas and works with our clients to create the best solution for their projects at the office and home. Schedule your appointment today!